Extend 4Kx2K HDMI monitor, Audio, USB keyboard, and USB mouse up to 400 feet using Gigabit Ethernet. Create video walls up to 8x8 – 64 screens. The XTENDEX® 4K HDMI USB KVM Over IP Extender provides remote KVM (USB keyboard, USB mouse, and 4Kx2K HDMI monitor) access to a USB computer up to 400 feet (122 meters) over a Gigabit network using a single CAT5e/6 cable. The local and remote units can be connected together for a Point-to-Point connection via CAT5e/6 cable or a Point-to-Many connection via a Gigabit network switch. Support for multiple transmitters requires a managed Gigabit network switch. Supports video wall installations from 1x2 to 8x8 screens. Also known as: 4K HDMI USB KVM extender single CAT5, HDMI KVM over IP, remote digital UHD monitor, 4Kx2K transmitter/receiver, extend keyboard monitor mouse, video wall controller. Supports Point-to-Point and Point-to-Many connections. 4 USB connectors for keyboard, mouse, flashdrive, HDD, or touchscreen display. Supports video wall installations from 1x2 to 8x8 screens. The XTENDEX® 4K HDMI USB KVM Over IP Extender provides remote KVM (USB keyboard, USB mouse, and 4Kx2K HDMI monitor) access to a USB computer up to 400 feet (122 meters) over a Gigabit network using a single CAT5e/6 cable. 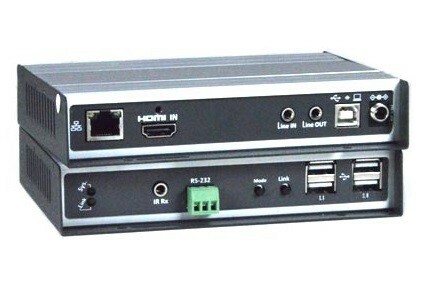 The extender consists of the ST-IPUSB4K-L-VW local unit that connects to a computer and the ST-IPUSB4K-R-VW remote unit that connects to an HDMI monitor, 3.5mm stereo audio speakers and microphone, and up to four USB devices (keyboard, mouse, flashdrive, HDD, or touchscreen display). The local and remote units can be connected together for a Point-to-Point connection via CAT5e/6 cable or a Point-to-Many connection via a Gigabit network switch. Support for multiple transmitters requires a managed Gigabit network switch. Supports Ultra-HD 4Kx2K resolutions to 3840x2160 (30Hz), 2K resolution 2048x1080, HDTV resolutions to 1080p, and computer resolutions to 1920x1200. Extend 4Kx2K up to 400 feet in a Point-to-Point connection. Extend 4Kx2K up to 1,000 feet in a Point-to-Point or Point-to-Many connection via a Gigabit network switch. The max length between the switch and the local/remote unit is 500 feet. Keyboard and mouse are hot-pluggable. Connect a mouse, keyboard, flashdrive, HDD or touchscreen display. Displays can be rotated 90, 180 and 270°. Support for multiple transmitters requires a managed Gigabit network switch with VLAN/IGMP support. Standard LAN switches can only support one transmitter. Each VLAN acts as a separate HDMI Over IP Channel on the network. When using multiple remote units, only one unit can have USB control over the source at any time. Manage transmitter/receiver connections and video wall configuration with built-in software. Supports 2-way RS232 commands (control software on a PC, or other automated control system hardware such as Control4 or Crestron) to control devices attached to the extender using RS232. Customizable EDID table on local unit. Easily expandable - add receivers as you add control stations. Compatible with a USB computer (PC, SUN and MAC) with Ultra-HD HDMI output. One female USB Type B connector. Two female 3.5mm stereo jacks for audio out and mic in. Microphone only works when in a point-to-point connection. One female 3.5mm port for IR emitter (sold separately). One female 1 Gbps RJ45 port for sending/receiving high definition video/audio, USB and IR signals. Four female USB Type A connectors for keyboard, mouse, flashdrive, HDD, or touchscreen display. One female 3.5mm port for IR receiver (sold separately). Supports embedded digital audio through HDMI compatible TVs or audio receivers. Support for a touch screen monitor. WxDxH (in): 5.91x4.33x1.10 (150x110x28 mm). Storage temperature: -4 to 185°F (-20 to 85°C). Operating/storage relative humidity: 0 to 80% non-condensing RH. 400 feet in a Point-to-Point connection. 1,000 feet in a Point-to-Point or Point-to-Many connection via a network switch. One 4.25 ft (1.3 m) male to male HDMI cable. One 6 ft (1.8 m) male USB Type A to male USB Type B cable. One 5 ft (1.5 m) male to male 3.5mm stereo audio cable. IR emitter and receiver sold separately. The XTENDEX® 4K HDMI USB KVM Over IP Extender supports video wall installations from 1x2 to 8x8 screens. For this 2x6 video wall example, there are twelve ST-IPUSB4K-R-VW receivers – one connected to each of the twelve displays; and four ST-IPUSB4K-L-VW transmitters – one connected to each of the four video sources.